Garritan has announced the future release next month of version 5 of their Personal Orchestra virtual orchestra software. Impact Soundworks has launched Rhapsody Orchestral Colors, a new symphonic instrument for Kontakt. On the eighth of their "12 Days of Christmas", Sonokinetic offer 40% off their Minimal orchestral cinematic library. Halfway through their "12 Days of Christmas", Sonokinetic offer its Tutti orchestral library for Kontakt at half price for one day only. The second of their "12 Days of Christmas" sees Sonokinetic offer its Grosso virtual orchestra at half price. 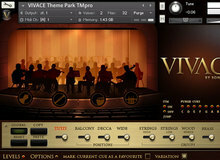 8Dio has announced that its upcoming virtual orchestra library for Kontakt, Majstica, can already be preordered. Spitfire is offering a special introduction price on its Ólafur Arnalds Evolutions library until tonight.